The Griffon Bruxellois or Brussels Griffon is a small breed of dog and is categorized as a toy dog, It is named after the city of Brussels, Belgium, which is where it this dog breed has it's origions. The Griffon Bruxellois may refer to three different breeds, the Griffon Bruxellois, the Griffon Belge and the Petit Brabançon. Identical in standard except for coat and color differences, in some standards they are considered varieties of the same breed, much like Belgian Sheepdogs. Sporting a human like expression, this cheerful dog breed is a good companion dog. 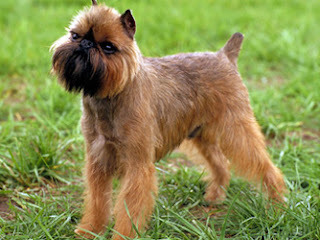 The Brussels Griffon is good with other pets, including cats and smaller animals, but do best with older children. Sensitive and curious, this is a demanding dog but gives great deals of love and affection to his owner.